I know I left you last on the edge of your seat, just waiting to see what imprint Sticky Chicken would leave on his visit to DC. Unfortunately, Sticky Chicken didn't get an audience with the President or even Pelosi, but he did have a fantastic time playing tourist. The day started on the Metro. A quiet, uneventful ride for most, but being poultry, it was quite exciting for Sticky Chicken. He's used to being cooped up, you know and just getting out of the peck and scratch of his day-to-day was a thrill to crow about. 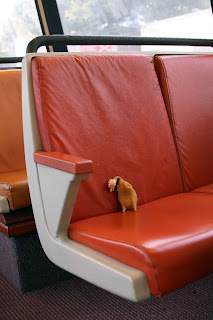 Here he is enjoying his ride. He loved the window view of the work-a-day world rushing by. Sticky Chicken visited the Smithsonian Museum of Natural History first. He just had to see his ancestors, so off to the Hall of Paleobiology we went (you know, birds are descendents of dinosaurs). Interestingly, he seemed most fascinated by the megalodon. Did you know that a prehistoric great white shark was three times the size of a modern one? 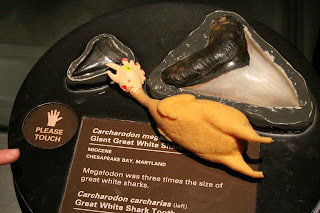 Did you further know that the prehistoric shark's teeth were almost as big a Sticky Chicken? The things you can learn at the Smithsonian! As is usually the case, the Natural History Museum was very crowded, it being a holiday and all. Sticky Chicken got a little anxious in the crowd and started having a bit of a panic attack, most likely spurred on from stories about crowded, confined spaces that he'd heard from some of his fowl family. He started clucking something about the crowd and Jim Perdue and then began running around like a chicken with his...well you know. Clearly, Sticky Chicken had had quite enough of prehistoric creatures and crowds so we headed next to the Museum of American History. This was much better, fewer people, smaller exhibits. 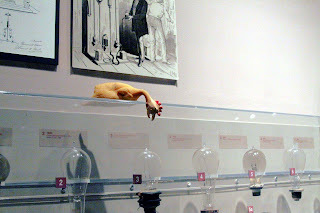 We saw many amazing inventions, an impressive toaster (yes, that's what I said) collection from the 1920's and 1930's, and the evolution of the light bulb. As Sticky Chicken points out in the image above, the screw-like base of our light bulbs today looks almost identical to the ones Edison fashioned. Interestingly, not much has changed in that area. 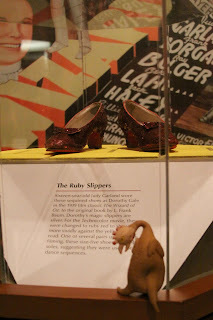 But the highlight of the day for our little friend was found in the Popular Entertainment collection...Dorothy's Ruby Slippers from the Wizard of Oz. I've never seen a chicken so excited over a pair of 70 year-old sequined shoes! The line to see the shoes was quite long and I worried for a moment that the Perdue flashbacks might start up again, but Sticky Chicken courageously winged his way up to the plexi-glass case and ogled those shoes. Strange behavior, don't you think, for a chicken, especially one without feet. By this time we were all tired from so much walking. We felt as those our feet were bloody stumps, especially Sticky Chicken. (Cheat shot, I know.) As we rode the train home, I could swear I heard Sticky Chicken as he dozed say "there's no place like home, there's no place like home". But then again, this all could be my imagination. omg Courtney, TOO TOO FUNNY! You really make a great photo Journalist. No kidding. 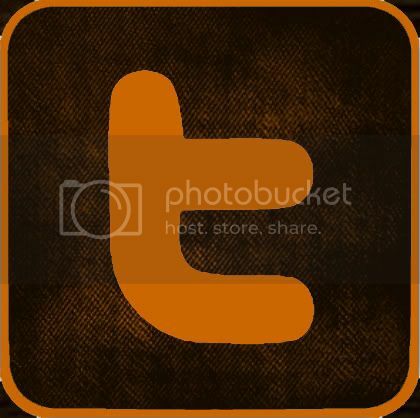 Your writing is so entertaining and vivid-and also w/ your photo skills, honestly, so fun to read!! so, i'm still at work, and i thought i would stop by to say hello while i'm on an up to date computer. i think i'm getting a new computer for home this week, so soon this will be solved. your sticky chicken travel tale had me smiling. i love the photos. hilarious and whimsical. well, not sure when i'll get to stop and comment again, but until then, i hope you are well and happy.